Whether the RRP is a fair price for a guitar that's been bashed about will depend on your allegiance to San Francisco's biggest heavy metal band, but we're just about happy with the Truckster's value - especially considering the wealth of tones on offer and the unusual livery. Good 'vibe' and surprisingly versatile tonal performance. It’s unlikely to appeal to those outside the Metallica fan club. The Truckster is Mr Hetfield's fifth ESP signature model and is unlike any other as its production run won't be limited to a mere handful of examples. 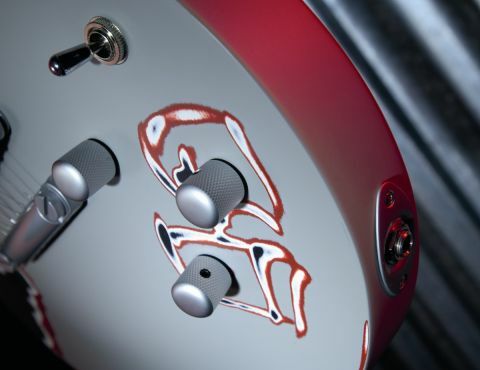 Hetfield used the original custom shop version of the Truckster on Metallica's St Anger tour in 2003 and this LTD option is as close to that in spec as price allows. What's more, the full-on Japanese-made ESP-branded model has been released at the same time as this slightly more affordable Korean version bearing the LTD legend. This decision offers arguably the best of both worlds, dependent only on the size of your wallet. "All we do is paint multiple layers based on what James originally did. He took an ESP Standard model in black and painted over it. So, there is a base paint job under there - black with white binding in other words. Over that, we paint a coat of white, then a coat of rust coloured primer, then a grey primer colour. These layers are sanded through in a way that matches James's original Truckster as closely as possible. Each guitar varies slightly as each is done by hand." This sanding is also applied to the rear of the three-piece mahogany neck, although it's so smooth that your left-hand shouldn't notice, and there are also some pretty hefty 'buckle marks', probably courtesy of a screwdriver, on the body's rear belly contour. The actual spec of the Truckster is also not too far removed from that of the Standard Eclipse - boasting an EMG 81/60 set of active humbuckers, a solid mahogany body, flag inlays and so on. Of course, Hetfield fans will also recall the JH-3 that had a limited run of just 100 examples that each retailed at £2,299 in the UK and featured pin-striping and gold hardware. One quirk that has made it from the JH-3 is the inactive three-way toggle on the upper horn. ESP told us that the reason for this switch (on the original JH-3) was Hetfield's desire to retain as much of the Gibson Les Paul vibe as possible. For extra stability, the Truckster includes a set of locking Sperzel machines that operate in conjunction with a TonePros System II tune-o-matic bridge and stop tailpiece array. The latter features locking studs that ensure a better join between the surfaces, thus adding to the quality of the tone and sustain and, what's more, you can re-string safe in the knowledge that neither the tail nor bridge will drop off. Getting to grips with the Truckster is simple enough, with the neck demonstrating a fairly shallow D-profile along with a standard 43mm nut-width. There's no getting away from the gigantic frets, but they have been nicely finished, and the unavoidable ridge between the neck binding and primer finish due to the lack of a clear lacquer coat doesn't get in the way. That said, we did find with our example that it took a few days for the action to settle down. Once it had, however, we kept returning for just one more blast of Sanitarium. The common misconception regarding EMG pickups is that their only proficiency is to produce a contemporary rock tone of the most righteous kind. There's no doubt that, given the best circumstances, they do that with ease. However, remember that players not known for their searing overdrive also swear by EMG - David Gilmour is one - and you should appreciate that the range of tones you'd expect from a mahogany single-cut are also available in spades, be it soulful warm jazz, scratchy blues, or Kossoff-style rock. Of course, through any decent amp's red channel, the Truckster has the potential to grab you by the throat, throw you to the floor and threaten to steal your dinner money. That classic scooped crunch is aided and abetted by the active EMG-81 in the bridge to produce a rhythm tone that's cutting, aggressive and great fun to blast away with. In contrast, the no less powerful yet slightly more distinctive EMG-60 at the neck offers a tone that should add serious grunt to your overall sound - especially if you play with another metal guitarist. Normally, a neck humbucker at high gain would be too mushy for anything other than sparing use, but such is the clarity and punch of the 60 that chords never become indistinct, due to a mid-range rich tone. Cleaner proceedings are just as impressive, and although the available tone isn't quite as stratospherically good as the aforementioned Pink Floyd man's set of SA units, here, with the centre position of the working three-way selected, the basic performance is certainly impressive.